Visit Jeanie's Articles at Acufinder! 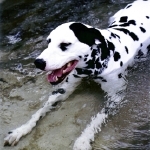 Jeanie has published articles on canine acupuncture and health on the Acufinder website. Acufinder is one of the premier sites in the United States for information about acupuncture and features the most comprehensive acupuncturist finder on the 'net to help you find a professional in your area. Books by Jeanie Mossa, Lic.Ac. What is the sound the uterus makes when a woman is suffering from fibroids or endometriosis? What are your options to treat these conditions? Most American women are given the choice of hysterectomy or hormone therapy until menopause to relieve the symptoms of these disorders. What most women don't know is that there is another, healthier way. Screaming Uterus Syndrome describes approaches to treating these ailments with Traditional Chinese Medicine, including acupuncture, herbs, vitamins, along with diet and lifestyle changes. A coloring book for the student of Chinese herbal medicine, bringing play and study together for more fun than you every thought you could have memorizing 250 herbs.